Do You Suffer From Excess Body Heat? All of us would have experienced body heat at some point of time. It is the sudden increase of heat inside our body that leaves us feeling very uncomfortable and irritable. Here, I would like to share some information about what can be the causes of excess heat in the body and how we can overcome this with a few simple modifications. Let us simply not blame some fruits or vegetables to be the culprit! The measurement of normal body temperature is maintained as 98.60F with slight variations irrespective of the climate. 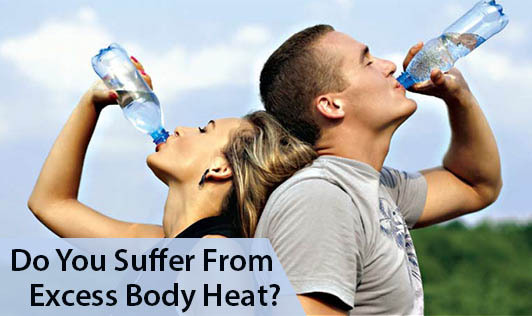 Excessive body heat can affect both men and women. Though fluctuations of body heat are a common phenomenon, it should not be ignored and must be handled correctly. The common causes of increase in body heat are:?• Infections which can cause fever and therefore, lead to an increase in body temperature. ?• Certain drugs and medications?• Humid or hot climate ?• Increased activity of the thyroid gland that affects the metabolic activity and causes excess heat. ?• High Intensity exercises and physical activities. ?• Neurological disorders, seizures and muscular agitations also lead to excess body heat. ?• Tight synthetic clothing blocks air circulation and traps heat inside. ?• Improper and unhealthy eating habits can lead to an increase in the body temperature. ?Increase in body heat can lead to burning sensation in the eyes, skin rashes, boils, acidity heart burn, headache, weakness, lethargy and disturbed sleep. ?To remove heat from the body:?• Avoid hot, spicy, oily and fried foods. ?• Reduce salt intake?• Reduce alcohol and caffeine intake. ?• Go vegetarian and say no to red meats. ?• Tender coconut water can help beat the heat when had regularly. ?• Barley water with lemon, can be had twice a day. ?• A weekly body massages with coconut oil or olive oil will help reduce the heat. ?• Include a cup of buttermilk after every meal. ?• Include a lot of fresh fruits and vegetables in the diet. ?Don't suffer from excess body heat anymore. Beat It! But if your excess body heat keeps bothering you after all these efforts, then it is time to see the doctor.